We will start this route in a town called Newry, Maine. Newry is located 6 miles East of Bethel and 17 miles west of Rumford Both on Rt.2. From Newry, ME, take Rt.26 north/northwest takes you through Grafton Notch State Park and on as it crosses into New Hampshire and into Errol, NH. From Errol, NH take a left (head south) on Route 16 down to Berlin, NH and on to Gorham, NH. From Gorham, take US Hwy 2 all the way back acrross the NH/ME border and on to Bethel where US Hwy 2 will turn north and take you back to the starting point thus completing your loop. This route is packed with scenery. Aprox. 8 miles from the starting point you will enter Grafton Notch State Park. Threw this area there are many mountain views. With a few stops and short walks Screw Auger Falls, Mother Walker Falls, and Moose Cave have a lot to offer for water scenery left behind from the glaciers years ago. If you want a good break from the bike and would like to do a good hike. I'd stop at the parking lot to the Appalachian trait. Head north on the AT and take the table rock trail. This is a few mile hike kinda tough going but with awesome views of Old Speck Mountain and the vally you just road up. Once on Rt.16 you will be passing some beautiful spots threw the 13 mile woods, which fallows the Androscoggin River. Wildlife is always possible to be seen along these routes as well. This route has a variety of road qualities. For the most part it is not too bad. I would say the Grafton area has a lot of ups and downs a few twisties, mostly good roads with a few rough spots along the way. Once on Rt.16 I would say it's more level with sweeping turns along the river. Rt.2 better maintained but much busier road as well. Grafton Notch State Park has a few good stops. One and the most popular would be Screw Auger Falls. This place has some awesome water scenery. There is a picnic area (tables threw out). And also has out house facilities. If your looking for a picnic area with out houses but with less people continue past Screw Auger Falls until you come to a place called Spruce Meadows. This place is not as popular but does on occasion have big events in it. There are small walking trails bringing you to the picnic tables. This area does have a couple good mountain views. Mother Walker Falls and Moose Cave are just nature trails bringing you to some cool spots but no facilities. Once in Errol NH If you're an outdoorsy type of person you should stop at LL Cotes They have all sorts of things there. There is a conv. store and Sub Way inside also. There isn't much between Errol and Gorham but once back on rt.2 there are many stores gas stations and restaurants. One of my favorites is a small out door BBQ pit on the left side of the road in the town of Bethel across from the Irving station. It shares the parking lot with the Good Food Store. It does not look like much but they sure do have some good BBQ. There are a few picnic tables out side to eat on. You can also change this route up some if you would like. In Errol if you head north on Rt.16 you can head to Rangley. If you want to hit the 13 mile woods but would like to make a longer trip out of this you could just stay on Rt. 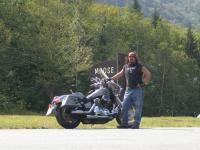 16 all the way to Conway NH then back to Maine threw Fryeburg on Rt.302 pick up Rt.5 all the way back to Bethel. That makes for a very nice ride with some good scenery along the way. Mix it up some its all good and its all fun riding roads. on August 6, 2018 0 out of 0 members found this review useful. Newery to Enroll looks to have been paved in early 2018 and it was probably our favorite road from our week in Maine no doubt helped by the new pavement. The 16 was good too but a little congested on the south end. For a sport touring rider I didn't get that excited about time spent on the #2 but it will get you there and it is in good condition. on June 2, 2018 0 out of 0 members found this review useful.